To help celebrate Responsible Pet Owners Month, our experts have compiled a list of toxic foods for pets, along with a list of foods our pets often enjoy. Have questions? We encourage you to speak with your family veterinarian. 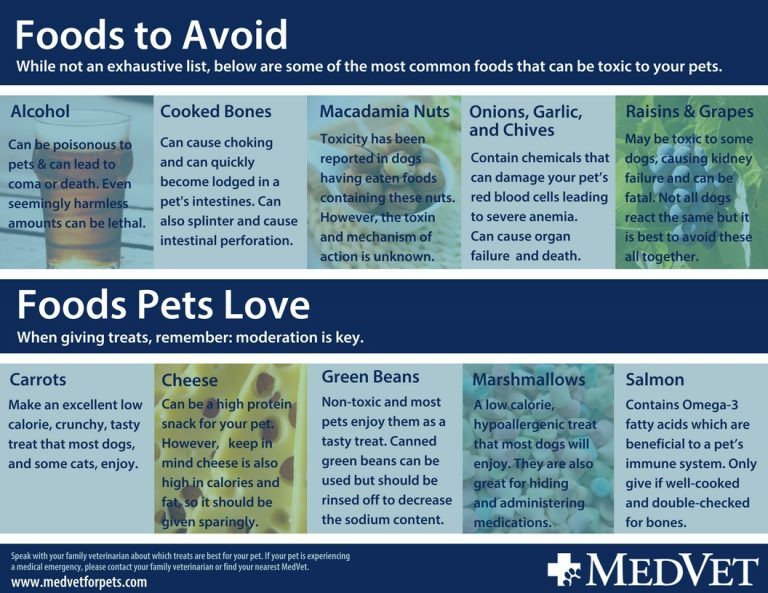 While not an exhaustive list, below are some of the most common foods that can be toxic to your pets. Alcohol can be poisonous to pets & in some cases, can lead to a coma or death. Even seemingly harmless amounts can be lethal so it’s best to keep alcohol away from your pet. Even in small amounts, chocolate can cause serious health problems if ingested by a dog. Chocolate toxicity can cause vomiting and diarrhea in addition to tremors, increased heart rate, heart failure, seizures, and in some cases, can be fatal. Food scraps such as cooked bones can cause choking and quickly become lodged in a pet’s intestines, which could require emergency surgery. Cooked bones also carry the additional risk of splintering, which can cause intestinal perforations when ingested. Toxicity has been reported in dogs having eaten foods containing macadamia nuts. However, the toxin and mechanism of action is unknown. As a result, we encourage pet owners to avoid this food. Onions, garlic, and chives contain a chemical called N-propyl disulfide, which is extremely toxic to dogs. When ingested, the chemicals damage your pet’s red blood cells which can lead to severe anemia. When a pet becomes anemic, they are at high risk for organ damage, organ failure, and death. Raisins and grapes may be toxic to some dogs, causing kidney failure and can be fatal. However, not all dogs react the same. Because the toxic dose is unknown and the toxic principle has not been identified, it’s best to avoid these foods altogether. Xylitol is an artificial sweetener found in certain sugar-free candies and gum. The substance is highly toxic to some dogs and has been found to cause low blood sugar and liver failure. Like humans, our pets love treats. However, too much of a good thing can cause stomach upset. When giving treats, remember: moderation is key. Carrots make an excellent low calorie, crunchy, tasty treat that most dogs, and some cats, enjoy. Cheese can be a high protein snack for your pet. However, keep in mind cheese is also high in calories and fat, so it should be given sparingly. If your pet is sensitive to lactose, aged cheeses such as parmesan and cheddar contain smaller amounts and therefore may be preferable to other types. Whole, cooked eggs can give your pet a treat packed with protein and essential fatty acids for a one-two punch. However, they can also be high in cholesterol, so limit how often eggs are offered. Green beans are non-toxic and most pets enjoy them as a tasty treat. Canned green beans can be used but should be rinsed off to decrease the sodium content before feeding. Marshmallows are non-toxic, hypoallergenic, and low calorie treats that most dogs will enjoy. They are also great for hiding and administering medications. Most dogs LOVE peanut butter. However, be sure to read the label to make sure the ingredients do not include xylitol, an artificial sweetener which has been found to cause low blood sugar and liver failure. Salmon contains omega-3 fatty acids which are beneficial to a pet’s immune system and can help your pets coat look shiny. However, it should only be given as a treat if well-cooked and double-checked to make sure all bones have been removed. Raw and undercooked salmon can contain the neorickettsia helminthoeca parasite, which can be fatal.